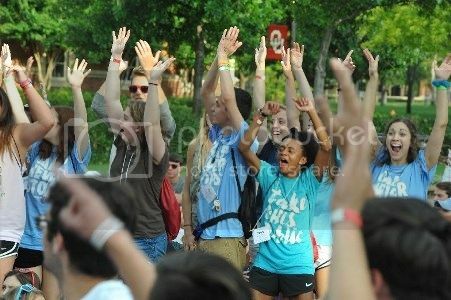 Camp Crimson is more than just a summer orientation camp. 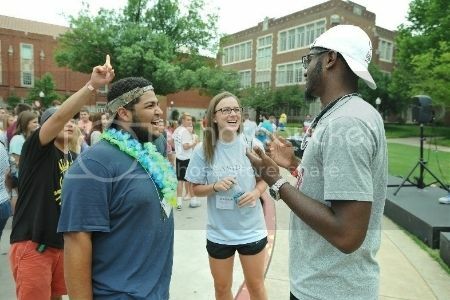 It's the beginning of a relationship between new students and the University of Oklahoma. Students learn about OU history and traditions, become familiar with campus, and learn how to succeed, but the most important thing that happens at camp is that new students are welcomed into the Sooner Family, energized about starting this new chapter at OU and connected with faculty, staff and students who will be part of their support network throughout their time at OU. Anybody who has been at Camp Crimson can see that it makes a difference. Students arrive on Wednesday nervous and unsure about college, and they leave on Friday wishing that they could start school on Saturday! But does the impact last? Yes! Research has shown that Camp Crimson has a positive impact on university retention and it helps connect incoming students to a vital support network that increases their institutional commitment and likelihood for success. Students only get one chance to attend Camp Crimson as a camper. And while attendance is growing, there are still many students who cannot attend because of the cost. Your donation can help us provide fee waivers for those students so that they, too, will have the opportunity of a lifetime to get an important head-start on their time at OU, to make valuable connections with other students, faculty and staff and affirm their decision to attend the university that we all love. There are two ways to help. First, you can donate to our fund to help us ensure that cost will not get in the way for any student who wants to attend Camp Crimson. Every donation helps and we have outlined several different levels with various perks. Whether or not you give, you can also help by sharing this project with others who care about Camp Crimson. Please encourage your friends to donate, whether on social media, through email or in person. The more people that know about this, the better we can serve our new students! Get that shout-out above, PLUS an awesome Camp Crimson sticker perfect for laptops, water bottles, your display case full of Camp Crimson memories...whatever! Get that shout-out, awesome sticker, PLUS a personalized thank you note and Camp Crimson photo! Get that shout-out, that awesome sticker PLUS a personalized thank you note and Camp Crimson photo. Are you ready for this? Give $250 and you get all the cool stuff above, PLUS you get an invitation to attend one of our Opening Sessions this summer! Are you ready for this? Get that shout-out, that awesome sticker, that personalized note PLUS an invitation to attend one of our Opening Sessions this summer! In addition to all of the AMAZING stuff from the $250 level, we will feature our $500-level donors in our Opening Session presentation and you will be individually recognized at the Opening Session you attend. In addition to ALL of the amazing stuff from the $250 level, we will feature our $500-level donors in our Opening Session presentation and you will be individually recognized at the Opening Session you attend!